Take flawless to-go with this retractable face brush. Simply remove the cap and slide down the sleeve to reveal tapered, synthetic fibers, specially designed to hold just the right amount of product for a gorgeous finish. When you're done, just slide-up the sleeve (it locks securely closed) and replace the cap. The smart packaging not only maintains the shape of the brush, it protects your purse from makeup residue. * APPLICATION TECHNIQUE: Swirl, Tap, Buff® * Preload Mineral Veil® finishing powder into this brush for hassle-free touch ups. What is the best way to clean this kind of brush? Is it even washable? I have a several BE brushes that have the regular long handle, which I clean with the brush shampoo with no problem. This brush seems a little more tricky with the retractable handle though. Is there a special washing method? I need to clean it, but I am afraid I will ruin the brush. Same way - put a little shampoo in your palm &amp; rub the wet brush in a circle in your palm. Rinse in warm water &amp; repeat if the water doesn't rinse clear. The key is to always keep the bristles pointed downward so the water doesn't get up into the handle (on all brushes). Squeeze out the water &amp; lay the brush flat on a towel or paper towel to dry. Easy-peasy! If this is supposed to be used for Mineral Veil, do you add it to the brush someewhere? I bought this &amp; can't figure it out. It's a waste of money. I can't figure out how/if Mineral Veil is added to the brush or if it holds Mineral Veil somewhere. It's a waste of my money as far as I can tell. It does neither. You would shake the mineral veil into the cap and swirl and tap the brush like you would any other brush. The brush is also amazing with the Ready Mineral Veil or foundation. How on earth do you make this brush retract? Just got it along with the Mineral Veil and nothing retracts. This is just a brush with lid. Looks like the picture on the website, says &quot;Buff &amp; Go&quot; on it, but it won't twist or anything in order to get it to retract. Help! You pull up the barrel of the brush from the base when you are done and replace the cap. It doesn't twist. 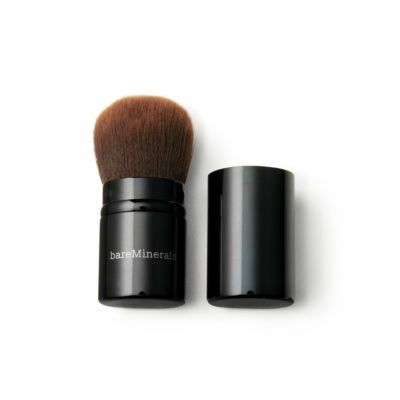 Is this brush best used on loose or solid mineral veil powder? Is this brush best for loose or for solid mineral veil powder? I have been using this with the Ready foundation, and it works like a dream! I am sure it would work very well with the Ready Mineral Veil as well. What is the height with cap and diameter of the Buff &amp; Go Brush? I am interested to know if this will fit conveniently in a make-up bag in my purse. Here are some pictures to give you an idea of what it looks like. It's portable, the bristles are soft and for me, it works great. I would use this Buff &amp; Go brush with foundation, the Soft Focus Face Brush for the mineral veil and the Flawless Face Application for the Warmth All Over Face Color. What is the Buff and Go Brush bristles made of? What is the Buff and Go Brush made of? Usually the BE brushes are made of Goat Hair. Some other BE brushes use Ox hair, Pony hair (both super soft; example: heavenly blush brush which I have purchased and fell completely in love with) and also Taklon.